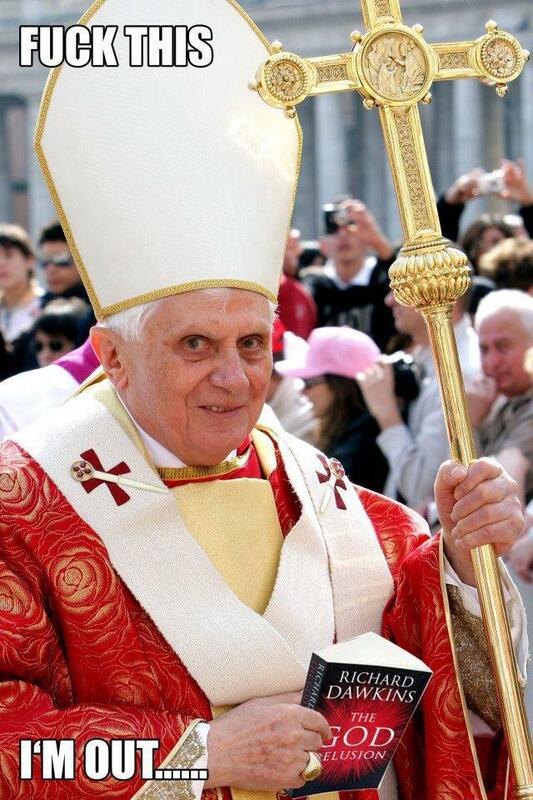 What do you think of the Pope resigning? Yes, I know a lot jokes are circulating today and this might be considered a cheap shot. But my first reaction was one of surprise – does his employment contract require only 2 weeks notice? Bloody hell, in New Zealand such short notice is usually reserved for casual labour. I sort of expected far more notice – after all his job description did include infallibility, and a direct line with his god. And the clothing allowance must have been huge. I suspect the golden parachute in his severance clause is also pretty big. My second reaction to the news was – is Benny a secret member of the Clergy Project. That’s a confidential on-line community for active and former clergy who have lost their supernatural beliefs. The community provides moral support and helps them with the huge adjustments resignation might require. After all, their former job required very few skills. concluded that his declining faculties left him unable to helm the Church’s ambitious regressive agenda and guide the faith’s one billion global followers on their steady march away from modernity and cultural advancement.